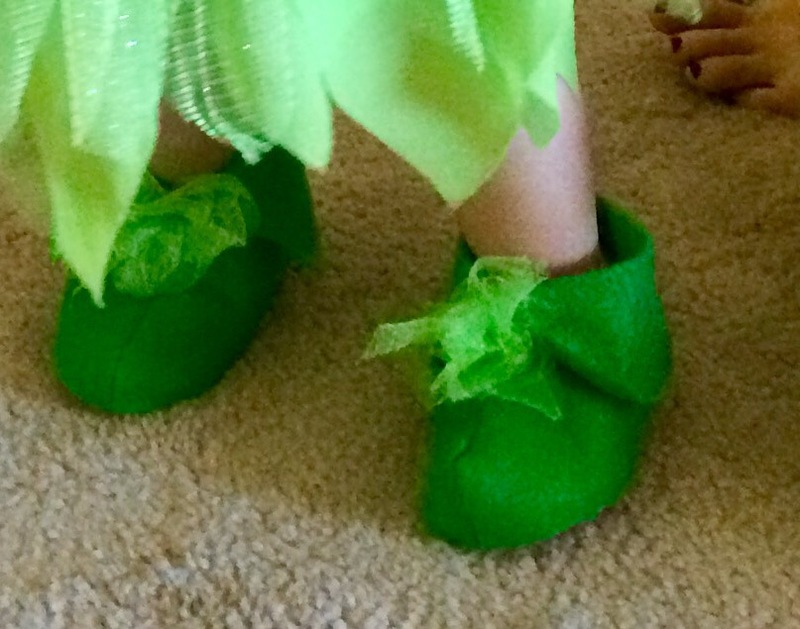 DIY Tinkerbell Costume – Crazy for D.I.Y. October 21, 2016 November 11, 2017 • Crazy for D.I.Y. Lots of glitter green tulle, green organza, green felt, elastic, gold ribbon, green embellishment flower and fairy wings. Everything was from Joann’s accept the fairy wings were a dollar store must. The organza was used to make a slip for under the tulle since it tends to be a bit itchy and a bit see through. I cut a piece that would generously wrap around and over lap a little. Then sewed a small casing for a 1/8″ elastic band. Then cut triangles out on the bottom to get the fairy look. This slip is separate from the tulle. The tulle was made that standard tutu “no-sew” method. Lots of strips cut from a couple yards of tulle. Each strip is about 3″x 18″ and tied around a 1/2″ elastic band. Then cutting the ends to be pointed and random. 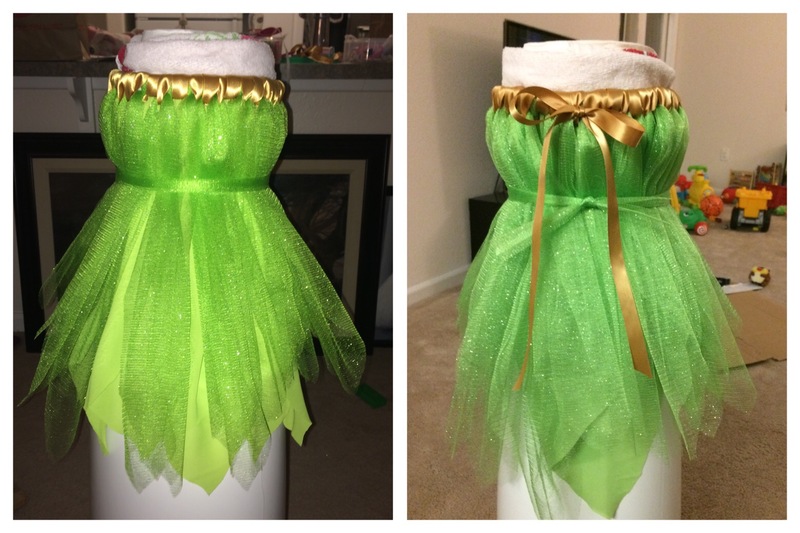 I used a paper towel on a diaper genie for my maiden form -lol. I wrapped a 1.5″ gold satin ribbon around the elastic band. The belt was some of the tulle scraps haphazardly sewn on to a strip of organza .. the messier the better! 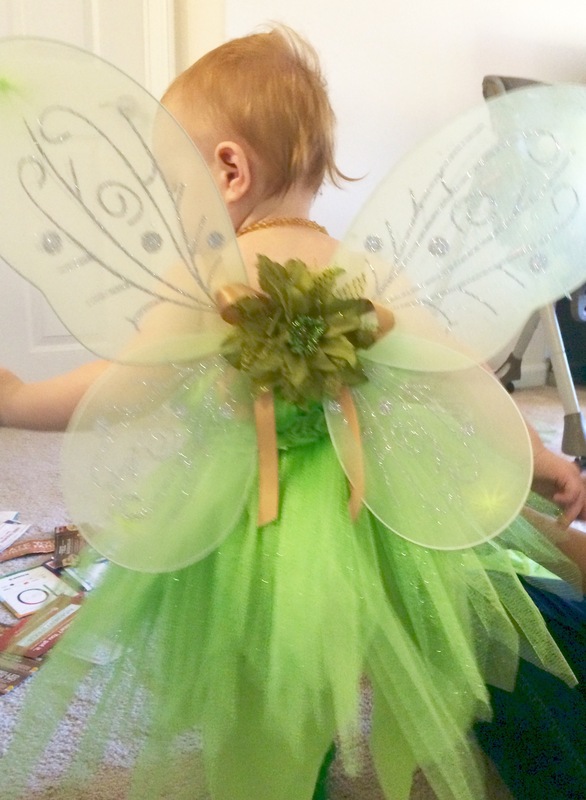 The green flower embeishment was pinned onto the fairy wings and the wings are pinned to the tulle elastic band. And when those were done… I attempted to make a fairy bag with the felt, ribbon and some wire I had lying around. 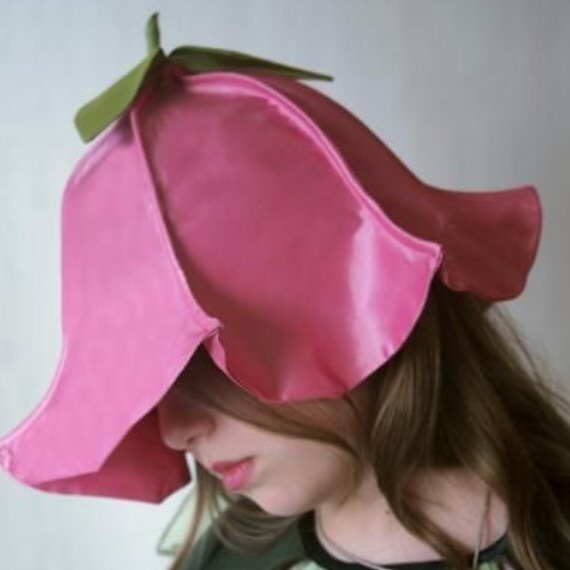 I cut 5 leaf shapes and sewed them together 3/4 up on each side. I sewed the wire circle around the opening of the bag to keep it open (this did not work because my wire was too pliable next time I would use wire from a wire hanger). Then sewed the gold ribbon as a handle. 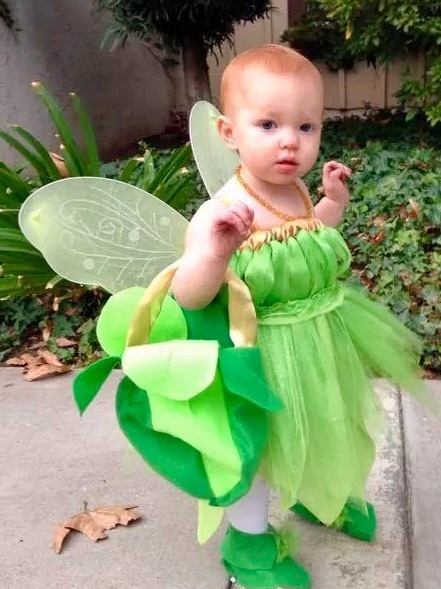 Posted in Halloween, SewingTagged costume, felt, Halloween, organza, sew, tinker bell, tulleBookmark the permalink.